Wedgie's wonderful world: Cats and Dogs! Me again! This time I am back with a fab new challenge from My Time to Craft! I love this stamp...I think those cats are so cute, I always imagine them singing altogether! My card has been coloured with my Promarkers, and I've gone with a green and brown colour combo. 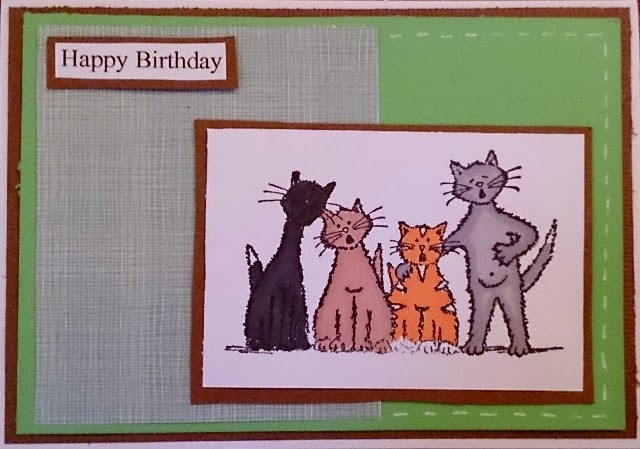 For more cats and dogs inspiration pop by the My Time to Craft challenge blog and see the fab DT cards have been created this week. 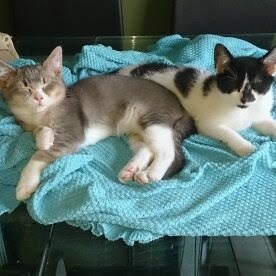 To be honest they are much bigger now (I'm such a sucker for kitten photos! ), but they are still just as cute! Great card Wedgie! Love the cat choir! Great card Wedgie, love the cat family image, great photo too. Those singing kitties are so cute - not as cute as Steve & Tinker, of course...! Great card - love it! Awwww your kitties are so sweet & I love their names! Great card hun, can just imagine them all singing together...really cute! Love this card, that image gave me a laugh. Your kitties are adorable.